To keep me super accountable, I'm also tracking my time. 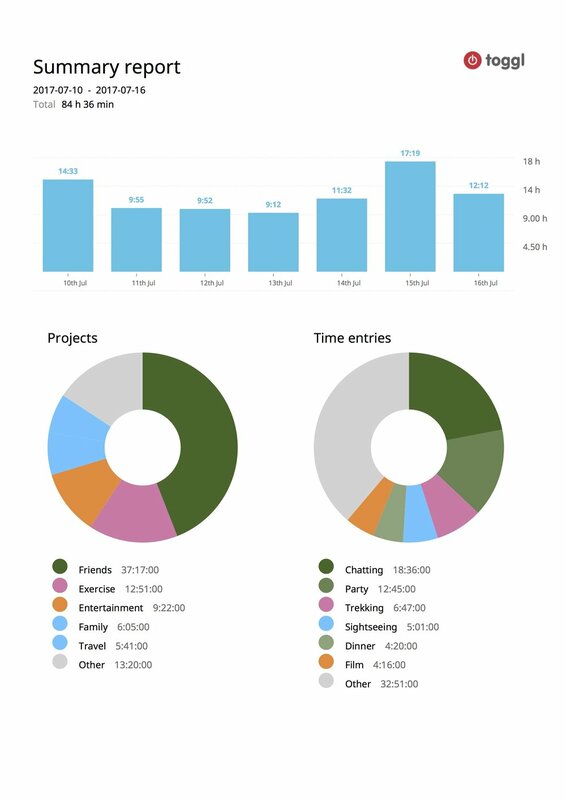 Everything I spend more than 5 minutes on (that's not a bodily function) I'm tracking on an app called Toggl. I'll post weekly summary reports below with a few comments on what went wrong, right, and how to improve. Things were a little disjunct in week one - getting used to the whole plan, where I can work and focus, I had a friend visiting, I got a bit carried away climbing during the day. Additionally, this is the first week I've started tracking again since a few years ago so forgot to start the timer on occasion. Better. I still spend more time with friends than I do on my Year of Projects which doesn't seem to be right. Climbing and chatting... a telling sign of me, perhaps. I was finishing off this website a few days this week, going forward I want to devote much less time to website creating/updating. This week I started coming to Google Campus every day for a full day of work, additionally I started daily meditation, and really enforcing the language learning (they're bunched under the 'other' category). First thing to note, I need to be more consistent with my time tracking - sometimes I track lunch with friends, sometime not for example. Time wise, I spent a combined ~26hrs on Year of Projects directly related work, this is not enough, anything under 35hrs is not focused enough. Friday was particularly bad this week as I missed most of the afternoon/evening surprising my younger brother for his birthday (a totally worthwhile distraction). This week was incredibly focused at times, and incredibly not at times. I spent a large portion of the week working on the Charity Investment Management idea, taking it far further forward, and applying to a US startups accelerator with the idea working alongside a very good friend. Towards the end of the week I started making preparations, and engaging in distractions before my upcoming trip to China with Gareth, more about that in the next report. China. An incredible opportunity came up to help out my map artist friend Gareth Wood, he draws the most incredibly detailed pieces of map art you will ever see - truly exceptional, take a look at his website Fuller Maps, he actually also kindly drew my dissertation cover Shòu 寿. Anyhow, Gareth's gone on a bit of a mission to Beijing, I used to live there, so he asked if I could come introduce him to the city for two weeks. A free trip back to Beijing is an offer I couldn't refuse. However, it has meant that working on my Year of Projects has been near impossible, other than completing some work for the US accelerator application form. Form completed and sent off for the Friday deadline, fingers crossed. It's tenuous perhaps, but improving language was one of my aims for this year, and speaking Chinese Mandarin every day for the past week has improved it no end. I was worried I'd lost it all, but it's come flooding back. I didn't break down the time entries in China as we have just been doing too much, all day, every day, it would have been inefficient. China. See the above description to find out what I'm doing in Beijing. It's been a rollercoaster - visiting places of cultural interest, losing my phone, going for dinner with my Chinese Auntie and Uncle (my homestay parents from my year abroad), going to all my favourite bars, the best clubs, the worst dives, making new friends, loads of contacts, networking evenings, getting lost in the hutongs - I'm knackered, but it's been incredible. I flew back on Monday eve, time to get back to work. Returning from China brought with it a whole host of personal admin tasks which took up time this week. Additionally, I am on the board of trustees for a charity that I directed some of my time this week towards. My time on business projects this week was scattered among a few smaller ideas and charity investment. I had two days of just about getting back into Year of Projects work this week, and then the Easter holiday took hold with a trip to Edinburgh on Wednesday to see Public Service Broadcast, followed by an Easter weekend festival from Thursday to the following Monday. The festival was very small, around 150 people, and was one of the most healing, educational and emotional weekends of my life. As much as it wasn't directly under the umbrella of my Year of Projects, I feel I learnt a lot about myself and the project during the weekend that will stay with me as I progress going forward. As mentioned last week, I was at a mini-festival until Monday. The festival, activities, and people I met left me with a beautiful feeling, but also raised many questions regarding my life, work, what I am doing with my Year of Projects. This resulted in needing a few days to really address some issues in my mind. As such, I spent much of this week pondering and contemplating. With the distraction of going to China at the beginning of the month and then this extremely unique festival towards the end of the month - I've essentially done no work on my Year of Projects for a month. I'm going through quite a period of change, especially mentally. You have those moments in life when your mindset, worldview, friend group, routine, priorities, feeling of purpose, understanding of the workings of the world, etc. plateau and all feels content, if not a little flat. Then you have those moments when everything you've based so much of your life, views, beliefs, focus on, explodes into a vibrant, sad cloud of confusion and questioning and it feels a little unnerving. I'm in the cloud a bit at the moment. However, strangely it feels quite good, I feel like a veil has been lifted and my understanding of the world around us has taken a significant step up, and from that higher perch, once I'm stable, I feel I'll be able to make far better life decisions over the next few months and years. It's put into question some aspects of my Year of Projects - who am I helping? What purpose is it serving? Am I being most efficient with the privilege of this opportunity? Suffice to say, I spent a lot of time talking things through with friends this week - 25 hours to be exact. As a result, I feel invigorated and more clear of mind today and for the weeks ahead. Something unexpected with having the luxury of time to think more deeply - short-term it can be a little disruptive, but I think long-term leads to great clarity, decisions and outcomes. A week of reasonably good and focused work on Year of Projects specific business ideas, mostly on an idea related to the future of wills and legacy in the lead up to a great meeting with a potential partner. Really educated myself up on many aspects of Wills and potential avenues to take the idea. In tenuous relation to my adventuring aspirations, I allowed myself to leave London on Friday to attempt the UK adventuring challenge the Welsh 3000s with great friends Ross Cullen and Nick Salmon. I'll write a blog post on it in the coming weeks - it was one hell of an epic, endurance challenge. This week I achieved far little Year of Projects work and focused a huge amount on some family obligations. There was an important celebration in my nephew's life which I indulged in researching and crafting a gift for and then spent the whole weekend at my brother and sister-in-law's house. I need to improve my balance between friends/family commitments and working hard on my Year of Projects goals. A good week of focused coding on my smartphone educational game prototype, still not quite enough. I also had another large family commitment over the long Bank Holiday weekend, in general I don't spend enough time with or communicating with my family so when the opportunity arises I try to leap at it. Lots of reading this week too, Sapiens is a fantastic book. This week was essentially a holiday but with a heavy focus on discussing life goals. I went to stay in a beautiful cottage in the Cotswolds with Jon Griffiths from Tuesday to Saturday. We ate well, read, meditated, went on long, life pondering walks. I haven't had a holiday not focused around some kind of activity or challenge in a very long time, it was good to take a step back from the pace of life in London. Over the weekend I had another family do, my niece and nephew's birthday party. I need to make sure I get back my focus on Year of Projects business goals next week. This week was the scheduled Lego build, I can't let out too much info yet as I'm firstly editing and then approaching certain potential leads before releasing the video online. Watch this space. Preparation for the Lego build took a few days, and then the build itself started at 6:30am ish on Saturday and went all the way through to around 11:30pm. I'm very happy with the result, sign up for my email updates to find out more. This week I spent as much time as I could editing the Lego build from the week before, there were over 9,000 individual time lapse images to edit and stitch together. I then had an event at my friends house in Switzerland that lasted from Thursday to Sunday (hence the large portion of 'Party') followed by a large family party back in England on Sunday celebrating my Mum, Dad, Brother and Sis-in-law's wedding anniversaries. A week of too much distraction. Glastonbury Festival occurred this week and rather stole my life from Thursday to the following Monday. It was the most fantastic festival experience I've had so far - the music, people, discussion, meditation, relaxation, debate, dance, etc. were all phenomenal. At the beginning of the week I focused on coding more of the Spotter App prototype. 3/4 of the week on 'Entertainment' is not the perfect life-work balance and I really need to address this issue of almost constant distractions week after week. I returned from Glastonbury on Monday, slowly piecing my life back together. The graphs look particularly workless this week, I did spend 9 hours distributed over Year of Projects work, but that is an unacceptably low number for a week. I'm aiming for 35 hour weeks on YoP work. I've really taken a hard look at this week in detail and will ensure next week is significantly better. I invested a large amount of time this week on preparing a talk I'd been invited to give at my nephew's school in front of 120 children. It was my first such gig and one that I wanted to get totally right. I certainly indulged in the time to prepare the talk, more than I should have. I gave the talk to my nephew's school on Monday, it went really very well. I'll put up a blog post soon on firstly talking to kids and secondly how the talk went. My brother filmed it beautifully so I'll try to get a version of it out soon. I then went to Slovakia to visit an old friend on Thursday so had a pretty distracted week in general with no where near enough Year of Projects business related work. I still need to address the feeling of attempting to cram in too many things at once and lose focus on the more important business aspects of this year. The large number of hours for 'Friends' this week is due to inviting a few mates round to my parents' place for the weekend. I also arrived back from a holiday in Slovakia on Tuesday. On Thursday of this week I went to the island of Lundy in the Bristol Channel, just off the coast of Devon to perform and film the first version of a new type of adventuring I'm trying to launch. I'll write a lot more about it soon, but it suffice to say it went off very well even with the inevitable British summer weather (torrential rain and gale 8 winds at times). I pushed my LEGO Tower Bridge time lapse video live this week. This ended up taking a large amount of my time to edit the video, upload, do a huge amount of PR and pushing the video to various media outlets, LEGO blogs, tech websites, etc. You can see the time lapse here on YouTube, and read more about the behind the scenes of the build here on Medium. I shall update this week soon.